Photo courtesy of Bob Pristash. Though the game started off very ugly for Evansville, the Purple Aces prevailed this afternoon behind a game-high 20 points from star D.J. Balentine and an Egidijus Mockevicius double-double. This afternoon, the 2015 CollegeInsider.com Tournament Champion Evansville Purple Aces took the court with the highest expectations for a single season during the Marty Simmons era. Two hours after tip-off, fans left the Ford Center with the same hopes but a realization that it will not come as easy as initially pondered. Taking on the Southeast Missouri State Redhawks of the Ohio Valley Conference, Evansville struggled to get the wheels turning as they had only eight shot attempts (three makes) upon taking a timeout with 12:15 left in the first half. How many did the Redhawks have? 14 attempts and 6 makes! Fortunately for coach Simmons, the timeout with the score at 13-11 Southeast Missouri State, settled down his group and inspired them to go on a 16-6 run (6 points each coming from Mislav Brzoja and Balentine) to take a 25-19 lead. After big man and Missouri Valley Conference preseason first teamer Egidijus Mockevicius finally made a wide open layup, the Purple Aces extended their advantage to 31-21 with 5:05 remaining in the first twenty minutes. At this moment, with momentum completely in favor of Evansville, one began to believe the home team was going to rout their opponent by 20 to 30 points. Unfortunately for the southern Indiana faithful, Joel Angus III had other plans. Angus III, who had a team high eighteen points and seven rebounds for SEMO on the day, sparked a mini-spurt that lifted morale and drew his team within eight (44-36 UE) heading into halftime. Coming out of the intermission, Angus lII got the party restarted with a made jumper that pulled his team within six. Succeeding an Adam Wing made jumper for the Purple Aces and five straight points from Southeast Missouri State's J.T. 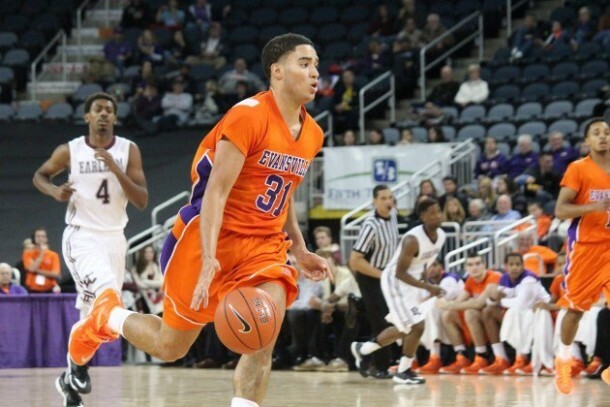 Jones, fans finally had themselves a ball game, for Evansville's lead had dwindled to two. The Redhawks bench was pure energy. Could they really pull off the road upset after their horrific loss at Dayton? Following three minutes of trading baskets, not Balentine and Mockevicius but Jaylon Brown and David Howard provided seven points, in the same time Southeast Missouri State scored two, to move the Purple Aces' lead to seven at the under twelve TV timeout. But the question remained, would Evansville be able to hold onto their momentum and ultimately the lead? This time, yes! With four of his six assists in a two minute span, Balentine drew his team closer to victory by raising Evansville's lead to a game high 16 (70-54). While SEMO's head coach Rick Ray attempted to stop the bleeding with his first timeout of the second half, the Purple Aces played their cards right for the final 7:53 to move their record to 1-0. Even though he missed two of the easiest shots a player could ever attempt, Evansville's six-foot, ten inch center Egidijus Mockevicius salvaged a 1 for 3 shooting start to have 18 points on 7 for 11 from the field. As he used his height on the offensive end to put the "biscuit in the basket," Mockevicius also dominated the defensive end of the floor with 10 rebounds (14 total) and 6 blocks. For the Purple Aces to have any chance of making the NCAA Tournament this season, the talented senior must be productive on a nightly basis. Heading back to Cape Girardeau for classes and practice, Southeast Missouri State will regroup prior to heading south for a date with Ladarius Tabb's Alabama A&M Bulldogs this Thursday. For the Evansville Purple Aces, Balentine and the gang will host non-Division I Marian University in a tune-up game Tuesday night prior to inviting Craig Bradshaw's Belmont Bruins to the Ford Center Saturday. Make sure to check back this weekend as VAVEL US will have full coverage of the mid-major showdown between Evansville and Belmont.